My Name is Margaret McBain. I have wanted to work with animals all my adult life. After raising 4 children and having countless pets, this is my time! My dream has come true! I can't think of a better way to spend the rest of my days than looking after your gorgeous cats. I have trained in cattery management with the Feline Advisory Bureau and I am dedicated to giving excellent care. We now have 2 very good members of staff that have under supervision become brilliant cat carers. My husband Gordon played a big part in the design and project managed the build from the start. We have run a successfull family Antiques business for the past 35 years. It is still going and my husband and son Arran look after that, so as you can see we are truly a family concern. 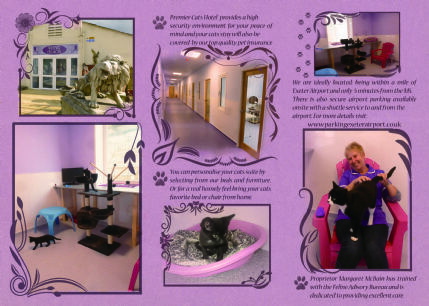 All rooms are supersized 3 x larger than the average cattery accommodation, with hospital style flooring,double glazed windows and hygenic easy clean walls. Furnished with chairs and climbing trees. Views from the window of the chicken run, so they get plenty of stimulation. As of October 2017 we extended the cattery to include rooms with courtyards and some with juliette balcony's so now we have 25 rooms all 3m x 3m some with courtyards 3m x 2m. excellent for families of cats. high for the more the more energetic visitors. Check out my facebook page. Daily updates via social media are very popular with my clients.The guests love their pamper sessions, they are stroked,fussed & cuddled. The caged Finches that are in the corridor are a special attraction for the guests, they love having them next to their window. All guest must be fully vaccinated and treated for fleas and wormed before they are admitted. special diets and medication can all be administered. Fresh chicken, Fish and tuna in springwater are now complimentary. Medication and insulin can be administered all included in the price. A deposit of approximately a third of the total cost will be required 6 to 8 weeks before the holiday to secure the booking. Card payments, cheques and Bank credit payments are all acceptable. Cancellations less than 2 weeks notice the deposit is none refundable accept in very special circumstances. From junction 29 M5 Follow signs to Exeter Airport.As you reach the airport turn left at the traffic lights. Continue on past car park 4 and the Flybe Academy, you will find The Antiques Complex 2nd on the left. Entering the car park through the security gates you will find easy access to The Premier Cats Hotel on the left. We look forward to meeting you.